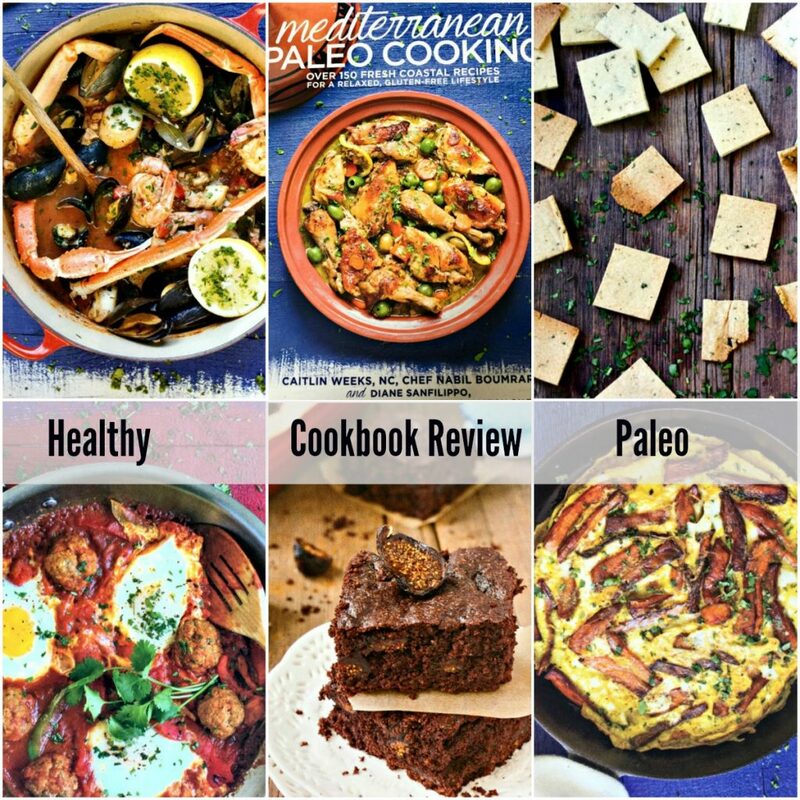 I was thrilled when the cookbook Mediterranean Paleo Cooking ended up in my mailbox. Nutritionist, Caitlin Weeks in collaboration with her chef husband, Nabil Bourmrar, and cookbook author/photographer, Diane Sanfilippo created a 432 page, colorful Paleo cookbook. Caitlin is a friend of mine, a gal pal I hang out with and a Nashville food blogger. We have a large overlap with how we see and view food, although she is much more intensely Paleo. She’s also super smart when it comes to nutrition and nutrient dense foods. We both agree that eating vibrant, healthy food leads to a vibrant healthy life. We both have hashimotos, an autoimmune disorder that attacks the thyroid. While I never have suffered the more harsh symptoms of this disease, which can be many, including intense fatigue and weight gain, Caitlin has, which led her to go to nutrition school and embark on a way of eating fights back and doesn’t trigger autoimmune reponses. She embraced the paleo diet, which led to Grass Fed Girl, which led to this eye-catching, informative and comprehensive cookbook. 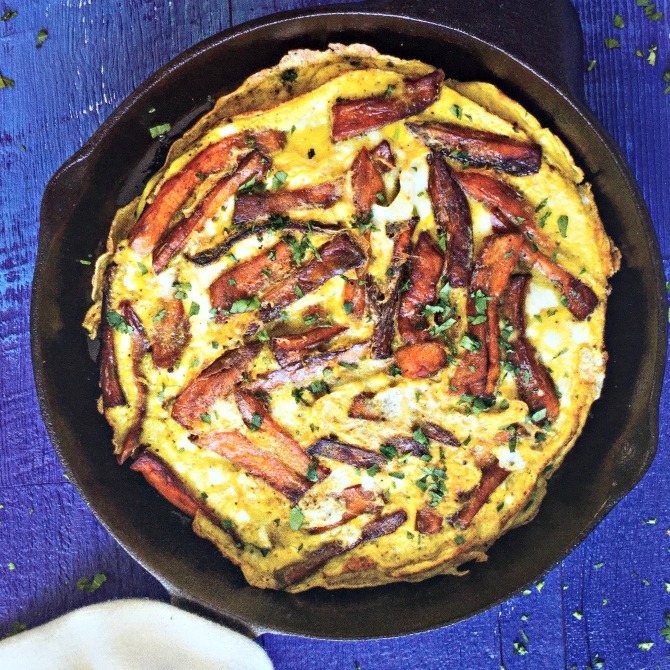 As you open the pages of Mediterranean Paleo Cooking, you will see that Healthy is Not Boring and You’ll Be Hungry. Caitlin co-authored the book with her Algerian chef husband, Nabil Boumrar, who incorporated the flavors of North Africa, and Dinae Sanfilippo who did the food styling and gorgeous photography. There are over 70 pages of information discussing Mediterranean recipes, how they evolved in North Africa, the Paleo Diet, health concerns, how to stock the kitchen, how to shop for the right ingredients, and how to meal plan. Mediterranean Paleo Cooking is a tremendous body of work before you even get to the 165 recipes, all of which are photographed. The recipe page not only has well written instructions, it will tell give you a list of special dietary concerns, noting if the diet is nut free, egg free, low FODMAP, AIP friendly, SCD/GAPS and lower carb. If the recipes is not any of these things, it may tell you what to leave out or replace to accommodate special dietary restrictions. If you don’t understand any of that, this book will teach you. We all know that eating Mediterranean style dishes means fresh, whole, real, life giving ingredients, and doesn’t mean processed food. Some of you will take to the book like an old friend, and some of you may be unfamiliar with what Paleo means. If you love a good, hearty breakfast, you will find favorites of mine like fried sweet potato frittata, and cinnamon spice pancakes. 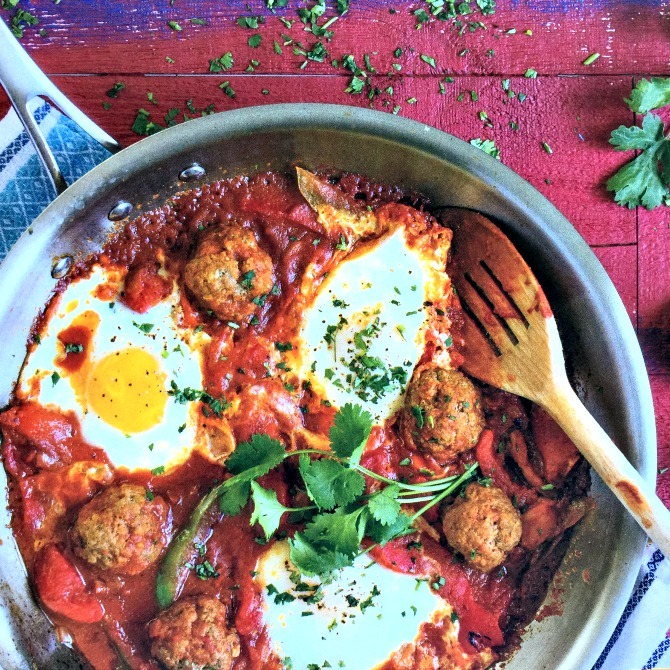 The meatball chakchouka is a Berber dish (the North African tribe Nabil’s family generates from) and is substantial enough to be also be served at dinner. Parties do not have to be boring to be healthy. 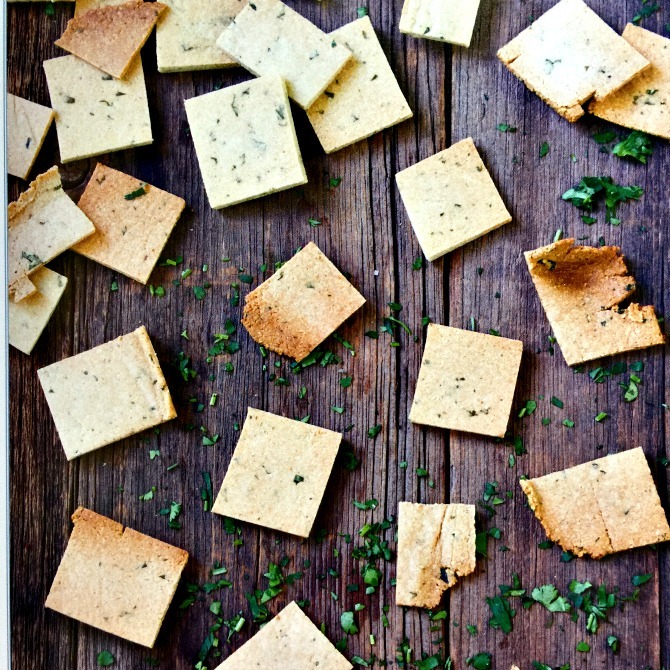 You can make your own cilantro gluten free crackers, to serve with a roasted pepper dip or a baba ganoush. The many chicken and lamb dishes are full of aromatic spices and often braised in clay pots and slow cookers. Lots of cumin, paprika, tumeric, and my favorite thyme, oregano and ground coriander show up frequently. One of the dishes I want to try next is the almond meatball soup, m’touam, a traditional slow-cooked Algerian dish, because it’s different and intriguing. Seafood is a natural part of a Mediterranean diet. Caitlin and Nabil both lived in San Francisco, so naturally cioppino, an Italian seafood soup/stew is included. 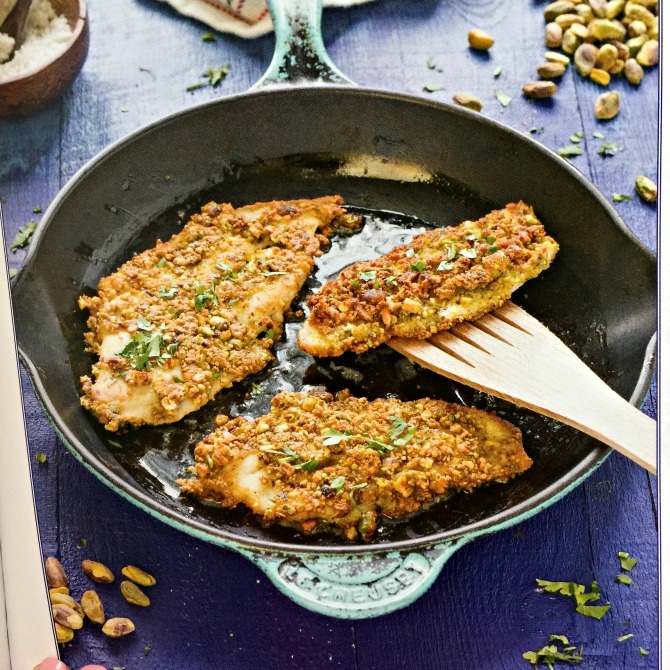 Pistachio-crusted sole is just another example of eye popping healthy food that is not tasteless and boring. You can still have fried foods as long you understand healthy fats vs fats you should never touch. Mediterranean Paleo Cooking includes some desserts, using almond meal, coconut flour, and coconut milk in many of the recipes, all staples of the paleo kitchen. 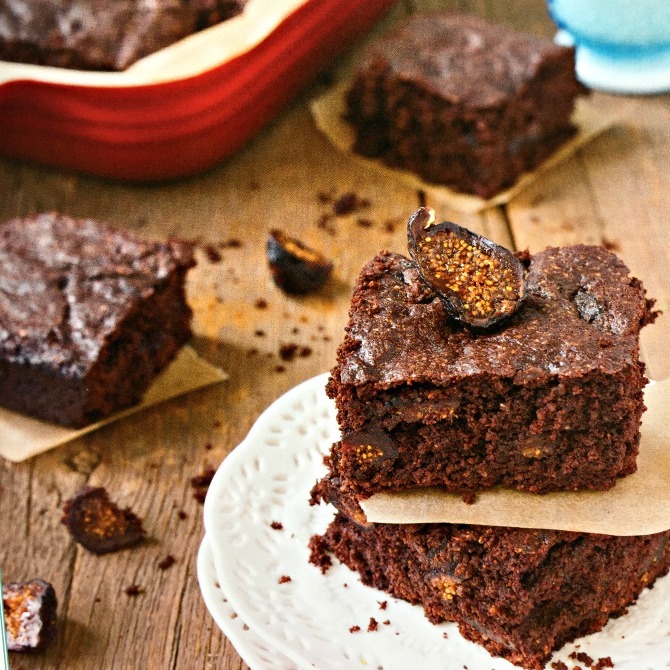 I want to try the fig brownies first. Her motto is gluten free, organic, grass fed, no matter what. Read how she restored her health through the right food. 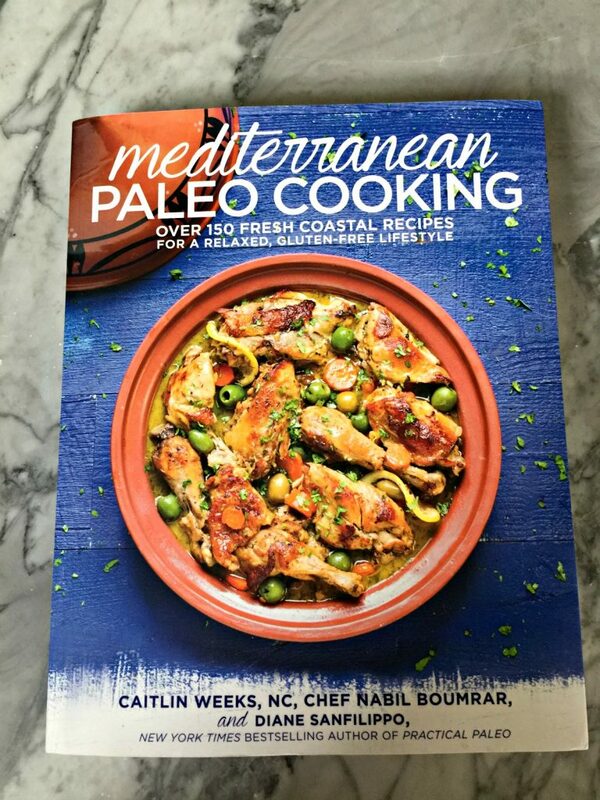 Pick up a copy of Mediterranean Paleo Cooking at Costco or order at Amazon below. Don’t forget your friends at Christmas either. Come back tomorrow for the dish I made in this Dutch Oven provided by Lodge. I couldn’t believe how delicious it was, and so simple in preparation. If you love paleo recipes, you’ll love my most popular paleo recipe, Beef Vegetable Soup and head on over to Grass Fed Girl for more recipes and a mecca of information.